I am here to tell you how I met the best friend I have ever had. 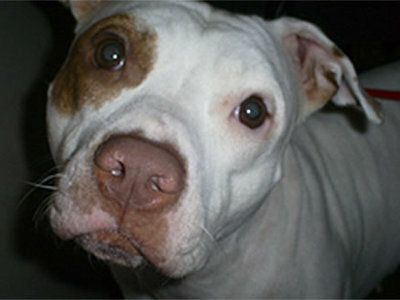 Her name is Malleigh, and she’s a four-year-old red-nosed Pit Bull. A friend of mine found a homeless puppy roaming around her neighborhood. At barely six weeks old, this poor baby was getting into the trash, trying to survive on her own. My friend searched the neighborhood, hoping to find where this puppy had come from. When she realized the pup had been bred for fighting, she immediately brought her to her own house and called me. She knew I loved Pits and would give her a wonderful, loving home. She brought the dog over, and I took one look at her and fell in love. Malleigh filled voids in my life. I had lost a Pit a couple of months before–Luke was my first love. He had gotten sick, and we took him to the vet, but the veterinarian didn’t know what was wrong with him. Luke stayed in the hospital for about three days. The day I went to see him and let him know that I loved him and couldn’t wait for him to come home, he started having trouble breathing. In a matter of minutes Luke was gone. So when Malleigh came into my life, I knew that everything would be ok. She looked almost exactly like Luke. My heart smiled again. It hadn’t done that since Luke passed. Malleigh is a wonderful dog. She always talks to me when I walk into the house after being gone. She is the angel that Luke sent to me. Not to replace him, but to help me to cope with his loss. It was the best day of my life when she entered it. She has made me extremely happy.